For the first time in almost two decades, a new, weekly live music series will kick off on MTV. The Wonderland TV show premieres live, Thursday, September 15, 2016 at 11:00pm ET/8:00pm PT. Watch a preview, below. Hosted by “Lizzo” Melissa Jefferson, Myke Wright, and Rachael Finley (aka Steak), Wonderland‘s upcoming performers include Tinashe, Ty Dolla $ign, and Broods. Danny Bell, Derek McLean and Ian Stewart from Done + Dusted executive produce Wonderland. Russell Thomas directs. Sandy Alouete is Executive in Charge of Music Talent. Wonderland, season one, consists of ten episodes. Watch the promo and get the details from the MTV press release, after the jump. NEW YORK, NY (September 8, 2016) – MTV today announced that Tinashe, Ty Dolla $ign and Broods are set to headline the premiere installment of “Wonderland,” its first weekly, live music series in almost 20 years. 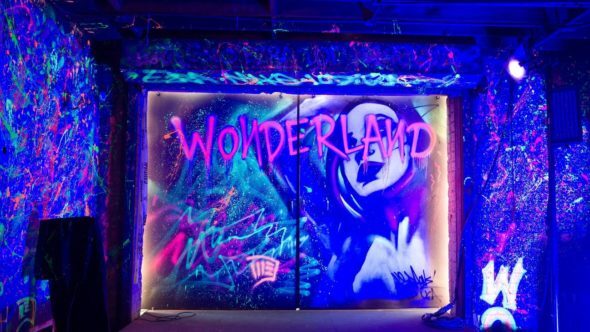 Live from the sprawling Imperial Arts Studios in Downtown L.A., each one-hour episode of “Wonderland” will serve as a place of music discovery. As a live multi-platform event, fans can check out exclusive extended sets and follow the artists in real time on Facebook Live and MTV.com during and following their performances. MTV Snapchat, Twitter and Instagram will serve up behind-the-scenes rehearsal footage and on-the-ground coverage on show night that will create an immersive POV, no matter where and how fans choose to experience “Wonderland.” The 10-episode season will air Thursday nights at 11:00 p.m. ET/ 8:00 p.m. PT beginning September 15. “Wonderland” is hosted by trio Steak, Myke Wright and Lizzo – themselves artists and fans who come to the project through different backgrounds reflecting different genres. Myke Wright is an up-and-coming stand-up comedian from Detroit who is making noise in the LA comedy scene, but his talents stretch far beyond comedy. Wright is also an artist, painter, musician and an avid consumer of all things music. Growing up, he learned a lot about music from his parents and was majorly influenced early on by classic rock, classical and jazz. As a child he used to rap battle other kids at lunch for their snack packs and steal his brothers’ hip hop mixtapes to trade with his friends. In high school, he started playing guitar and joined several rock bands, switching to play bass along the way. Wright moved on from his rock band phase to form a rap group in Detroit called “Phresh Heir,” which recorded two mixtapes and gained a solid fan base. During the in between moments in songs, Wright used that time to chat with the crowd and crack jokes, laying the foundation for his eventual move into solo stand-up comedy. When he isn’t performing, Wright frequently attends indie shows at dive bars in Los Angeles. He likes listening to what nobody else is listening to and discovers a lot of music by dropping by venues at random to see who’s playing. Wright is definitely the life of the party, the center of attention, and the ringleader of his crew. Rachael Finley, otherwise known as “Steak,” is an LA-based underground culture vulture whose fingers are constantly on the pulse of what’s happening now. Steak grew up in South Florida on a diet of OG internet, pop-punk, and skater style. Her nickname draws from the large amount of steak she grilled, often for her whole neighborhood. Steak graduated from high school early and has been involved with music ever since. Throughout most of her teenage years she toured with various metal bands, selling merchandise and living on a tour bus. She then moved to Los Angeles to work for a record label and has since found her niche in fashion, preparing to open “The Shop” in the sprawling Fairfax spillover on to Highland Ave featuring her two clothing brands and a random assortment of trash. Steak has written mostly pro-femme articles and posted fashionable snapshots which has helped create a massive social media following amassing over 120,000 followers on Instagram and Twitter combined. She has recently done a lot of correspondent work with VICE, and is in talks to be a contributor on a weekly podcast that discusses skate competitions and skate culture as a whole, which she will also run out of The Shop. Steak is also heavily plugged into the television world, as her husband Blake Anderson is on the Comedy Central show “Workaholics.” Together, they own and operate their own clothing brand, Teenage and she is now breaking into women’s clothing with her Girls line called Hot Lava. Steak has a very unique taste in music and listens primarily to nonmainstream rap, as it comes not from a “rich” point of view, but from a “getting there” point of view that she closely identifies with. She is an avid internet & social media user and discovers new music through aggregated platforms like Soundcloud and Tumblr. A singer, songwriter, producer and renowned entertainer, Tinashe is known for her eclectic mix of pop, R&B, electronics and forward-thinking productions. She is currently gearing up for the release of her highly anticipated sophomore album Joyride, set for release this fall on RCA Records. The album includes lead single “Superlove,” which was released earlier this summer to much acclaim, with USA Today calling it a strong contender for “song of the summer.” Joyride is the follow up to Tinashe’s debut studio album, Aquarius, which received a rare wave of unanimous acclaim upon its release in 2014. The Los Angeles Times heralded the album as “one of the more inventive R&B debuts in years,” while the Associated Press said that “”Tinashe delivered an album that moved the needle… her whispery vocals glide over the songs’ beats so nicely you’ll constantly hit repeat.” The album, which made nearly every Best of 2014 year-end list, was anchored by the Platinum-selling single “2 On (Featuring ScHoolboy Q),” 2014’s de-facto R&B Song Of The Summer. A hit in the Billboard charts, “2 On” spent five back-to-back weeks at #1 on the Rhythmic Airplay chart. Aquarius also featured the fan-favorite single “All Hands On Deck,” which set the internet ablaze with it’s instantly classic music video – a clip so engaging even Kanye West gave his rare stamp of approval. Since releasing their breakthrough debut album, Evergreen, in 2014, the brother-sister duo of Georgia and Caleb Nott – better known as Broods – spent the better part of two years on the road learning the ins and outs of what it means to be a band. A renewed sense of confidence is evident on Conscious – Broods’ highly anticipated sophomore album. Recorded at studios between Los Angeles and the band’s native homeland of New Zealand, the album is an audacious step forward for the band. Co-produced by long-term collaborator Joel Little (Lorde, Ellie Goulding, Jarryd James), Broods, Alex Hope (Troye Sivan), and Captain Cuts (Halsey, Tove Lo), the record is both bigger and bolder than anything the duo have done before. The album’s anthemic first single, “Free,” has amassed nearly 10 million streams globally on Spotify, and nearly 16 million streams worldwide across all platforms. The single has been certified Gold in Australia and New Zealand. NPR hailed “Heartlines,” which Broods co-wrote with fellow New Zealanders Lorde and Joel Little, as “a bubbly, revelatory dance track… soon to be a summer anthem. The album also includes “Freak of Nature,” a darkly personal ballad about embracing and overcoming your own personal demons, which features Tove Lo on vocals. Danny Bell, Derek McLean and Ian Stewart from Done + Dusted serve as Executive Producers for “Wonderland.” Kristina Edwards and Garrett English (for MTV) and Jonas Larsen are Executives in Charge of Production. Russell Thomas is Director. Sandy Alouete is Executive in Charge of Music Talent. Want to stay in tune with all things #WonderlandMTV? Follow us on Instagram, Twitter and Facebook. MTV is a global media brand inspired by the creative spirit of music and the freedom and passion of youth. MTV is a unit of Viacom Inc. (NASDAQ: VIAB, VIA). Founded 20 years ago with offices in Los Angeles and London, Done + Dusted http://www.doneanddusted.com has made a name for itself as one of the biggest live events and television production companies in the world. The company is a rarity in that it is capable of executing a live event from concept, through design and staging to broadcast in every medium and every format worldwide. Company milestones include producing: the London Olympic and Para-Olympic Opening and Closing Ceremonies (the first time an independent production company has ever produced an Olympic Ceremony); the largest televised event in UAE history – The 40th National Day Celebrations; the largest EDM event ever staged in Ibiza, Spain; Madonna at Brixton Academy in London, which set an Internet viewing world record and crashed the Web and countless other firsts. D+D have worked with almost every major recording artist in the world. Recent and upcoming projects include: U2’s iNNOCENCE +eXPERIENCE HBO Special, Katy Perry: The Prismatic World Tour television special, the 2016 Nickelodeon Kids Choice Sports Awards, Stand Up to Cancer, The Victoria’s Secret Fashion Show and many others. What do you think? Do you like the sound of the new Wonderland TV series? Do you plan to watch the first season premiere on MTV? Tell us. More about: MTV TV shows: canceled or renewed?, Wonderland, Wonderland: canceled or renewed? Teen Wolf: Cody Christian Returning for Season Six?